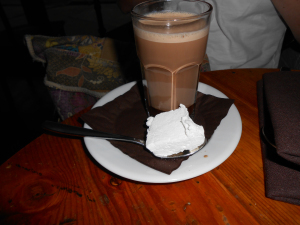 Hot Chocolate is a restaurant that serves food but also delicious desserts. 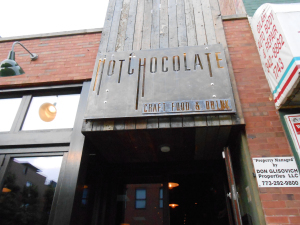 It can be found on 1747 N. Damen Ave. An easy way to get there is the Blue Line Damen-O’hare stop. 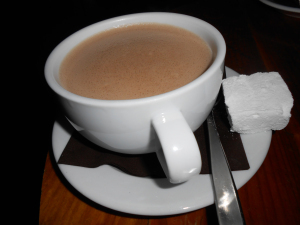 A friend and I met to go to Hot chocolate one evening and she got the above pictured, Black and Tan hot chocolate. It is 1/3 hot fudge and 2/3 medium hot chocolate with a homemade marshmallow on the side. I ended up ordering the medium hot chocolate which is milk chocolate with a bit of dark chocolate and caramel with a homemade marshmallow on the side. Both were ridiculously delicious. We also got some desserts which took awhile to decide on. 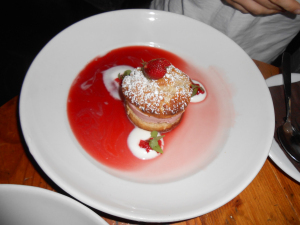 My friend ordered the Strawberry, which is a shortcake with strawberry ice cream, crème fraîche, strawberry relish and a sparkling rose and strawberry broth. 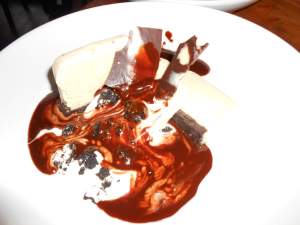 I ordered Fernet Branca and mint which is a fresh mint frozen nougat, an oreo brownie, Fernet Branca hot fudge and chocolate bark. When they bring you your desert they hold off on pouring the hot fudge or the sparkling rose and strawberry broth to tell you about your dessert and pour the sauce over your dish while they’re explaining. Mindy’s Hot Chocolate is a place I definably want to return to. They have somewhat odd hours. They are closed on Monday’s, are open in the evenings every other day of the week. Outside of dessert they do brunch (saturday and sunday), lunch and dinner.